Artemis Fowl. The last guardian [electronic resource] / Eoin Colfer. Restrictions on Access Note: Digital content provided by hoopla. Summary, etc. 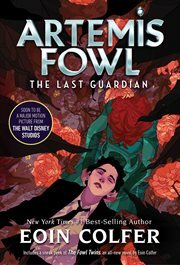 : Seemingly nothing in this world daunts the young criminal mastermind Artemis Fowl. In the fairy world, however, there is a small thing that has gotten under his skin on more than one occasion: Opal Koboi. In The Last Guardian, the evil pixie is wreaking havoc yet again. This time his arch rival has reanimated dead fairy warriors who were buried in the grounds of Fowl Manor. Their spirits have possessed Artemis's little brothers, making his siblings even more annoying than usual. The warriors don't seem to realize that the battle they were fighting when they died is long over. Artemis has until sunrise to get the spirits to vacate his brothers and go back into the earth where they belong. Can he count on a certain LEPrecon fairy to join him in what could well be his last stand? New York Times best-selling author and comic genius Eoin Colfer will leave Artemis Fowl fans gasping up to the very end of this thrilling finale to the blockbuster series.